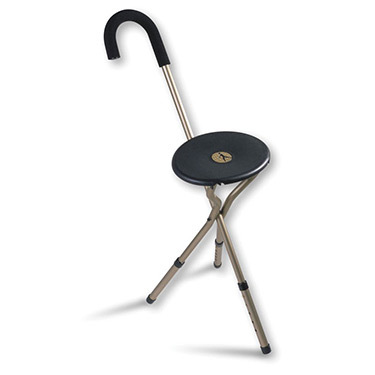 The Mountain Properties (Alex Orthopedic) Tri-Seat Adjustable Seat Cane conveniently folds up for use as a cane or lightweight, portable seat. Lightweight aluminum, weighs 2 lbs. With an attractive matte bronze finish, the Tri-Seat features a foam grip handle, comfortable formed seat and is fully adjustable.When sitting, straddle the seat, center your weight on the seat and don't use on gravel or other uneven surfaces. Seat height: 18 - 22in. Walking height: 34.5 - 38.5in. Seat diameter: 10" wide x 8" deep. Weight capacity: 250lbs. i need this cane and i love it. every elderly person should buy this cane/seat. Cons:like everything about this cane. Very good product, only problem with it is that the cane leg will not align with the other two and stay in position when used as a cane, I have to keep on pressing it back every few minutes. Only problem with it is that the cane leg will not align with the other two and stay in position when used as a cane, I have to keep on pressing it back every few minutes. Pros:Steady and practical for those who have knees' or feet problem and can not stand or walk for long. Cons:The legs not aligning in one plane when closed to use as a cane. I haven't really used this product yet, but it is exactly what I have been looking for. Will be taking it on an overseas trip next spring. Customer service was excellent!! Pros:Has the seat!! I need to rest every half block or so. This will be perfect. Cons:I have none..hope it will pass for air travel.